Last year was filled with several new community outreach activities and volunteer opportunities for Port Houston staff. Team members participated in 37 different events, completing more than 1,700 hours of volunteer time. 2019 is kicking off in a similar manner, as Port Houston continues to help improve the quality of life in our region. For example, employee donations more than doubled in the first large community initiative of 2019, which was Port Houston’s annual food donation drive benefiting the Houston Food Bank. Employees provided 2,000-plus pounds of food. 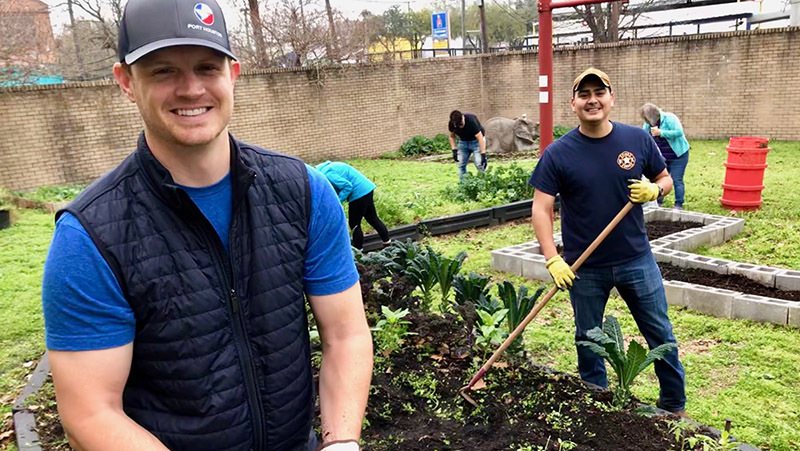 Other outreach activities in Port Houston’s first quarter include participation in a trash clean-up near the Lynchburg ferry, a tree planting at Turtle Bayou Nature Preserve, and a renovation of an East End garden. Team members also participated as judges in a local academic decathlon and a robotics competition. Additionally, a number of employees continue to be involved in Read Houston Read’s weekly mentorship program. “We try to find unique and interesting volunteer opportunities that match employee interests with our business priorities,” said Leslie Herbst, community relations and events director for Port Houston. “This helps us better engage our Port Houston team, but it also provides an increased impact in the community,” added Herbst.